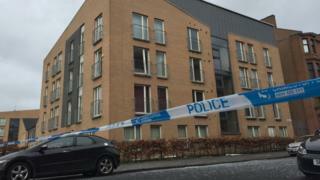 A 26 year old man has been arrested in connection with a gas explosion at a flat in Elderpark in Glasgow. Paramedics, firefighters and police were called to Kennedar Drive in the Govan area of the city, following reports of the blast at about 07:05 on Friday. A 26-year-old man and a 30-year-old woman were both taken to hospital. The man's condition was described as critical and the woman was later discharged. Police Scotland say inquiries were continuing.